I was part of the team that led the first week of "English for Kids" Bible Camp in Quebec City. Our team included members of New Life OPC (Williamsport, PA) where I serve as an elder, two members of Neon OPC (Neon, KY), a young lady from Calvin OPC (Phoenix, AZ), her friend from Grace OPC (Philadelphia, PA), and two young ladies from Ontario, Canada. 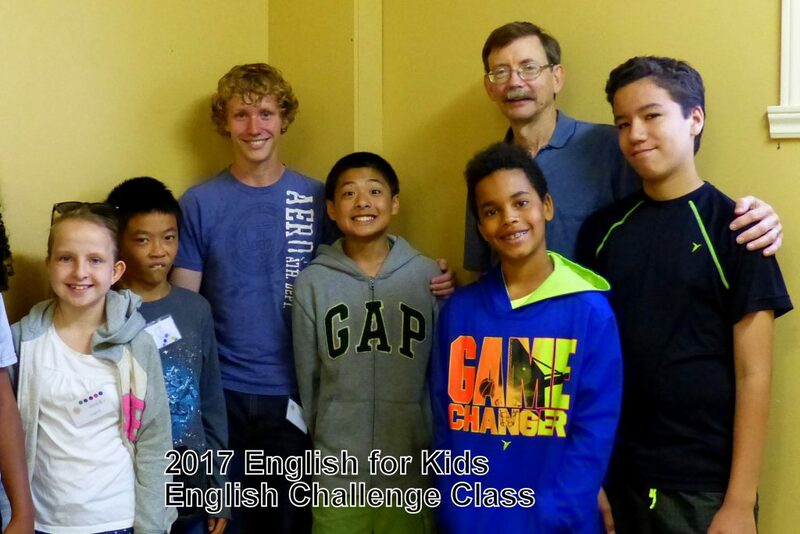 I taught the highest English level group called "English Challenge." Six kids were assigned to my class. We read and discussed the themes of Pilgrim's Progress each day. These kids like to read English, so each day we read a chapter of the children's version offered by Great Commissions. Each day we added more information to our wall mapping of Pilgrim's journey from the City of Destruction to the Celestial City. The first day of class we talked about what causes a neighborhood to be really bad. Then each student drew a picture illustrating this awful place to live. These were posted on the wall to represent the City of Destruction that Pilgrim was fleeing - and being rescued from. I had two backpacks and put two gallon bottles of water in each. Then we had a relay race during which each team member had to pick up the backpack and put it on, then run an obstacle course in the classroom and get back in order to pass on the heavy backpack to the next team member. This demonstrated to all the weight and discomfort involved in Pilgrim's "burden." We discussed how this burden in life is our weight of guilt before our Creator God. The next day I was pleasantly surprised at how quickly the students understood that no one could satisfy God by keeping the ten commandments. Something else is needed if we are going to be acceptable and loved by God. The next day included Pilgrim's burden rolling off his back when he approached the cross. The students thought it was cool how the burden of guilt rolled into an open grave! This is the time we talked about how God provided a solution for our burden of guilt by providing his dear Son who took our guilt, even though he never deserved it, and was actually able to keep the ten commandments in our place. Finally, we discussed the best place they could imagine and drew pictues of it that were hung on the wall as the Celestial City. Their first impression of the best imaginable place was a city with free wifi, free food, and huge TVs. Later they added things like peace, love, compassion, and kindness. As well as no guilt, and no tears. Each day we read from the Scriptures, learning about our sin, our Savior, and the new heavens and new earth. Each day my classroom assisstant, Caden Lantz, helped the students learn a Bible verse. They learned the verse of the day so easily and quickly that Caden went on to have them memorize the 23rd Psalm, which they did very well. On the last day, Pastor Bernard Westerveld invites parents and family members to join their children at a burger barbecue and final program. During the program, Pastor Bernard summarizes what the kids did during camp, including an explanation of the gospel. Each class presents something such as a song, a recited Bible verse, or the like. My class contributed to a skit that the next class down, the "Advanced Class," worked on. After this, two of the class recited the 23rd psalm by memory before all the parents. The burst of applause that followed displayed the happy reaction of the parents. These two students are not yet believers but continue in our prayers as we ask God's Holy Spirit to open their hearts to their loving Lord and Shepherd. For me, I saw the Lord working to give me strength each day to expend energy in leading the children to explore Pilgrim's Progress, learn the gospel, and enjoy the crafts and outdoor game activities. As a senior citizen working with these young people, it was a challenge to keep up and keep connecting. But God did it! Each day I had the energy and ideas I needed to love these kids and apply the gospel. It was a joyful experience for me and a great opportunity for me to use gifts that should not lie dormant.